Everyone has those days, days when you run out of steam, have nothing left to give to the world, when the word “hi” seems extremely annoying. We have all been there, and we all cope with these moments differently. On the longest days in the world, working in a café in Orlando, I had my special way of managing. 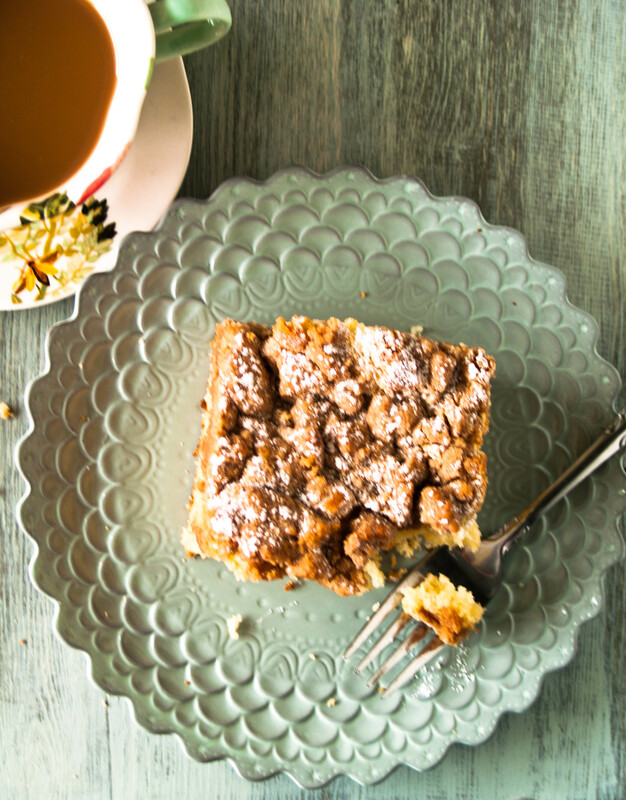 My magic wand came in the form of a warm, moist cake capped with a crunchy cinnamon topping. 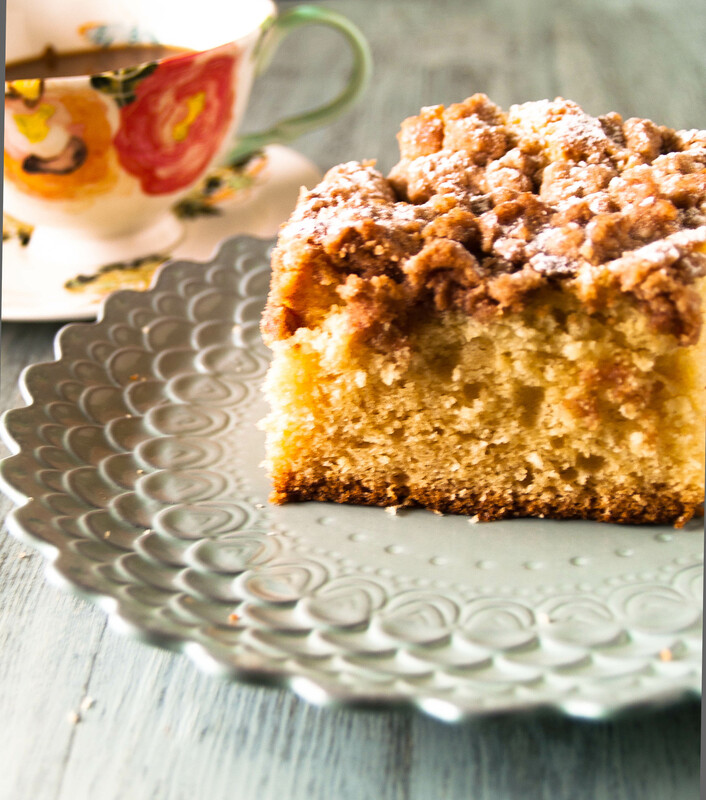 This coffee cake makes everything better. On the worst of days, I would eat just the topping of at least three or four of these little pieces of heaven (Shhh…). Life seems a little brighter, people seem more tolerable, and the day is never all for not. So for all of you who want to knock the hats off of everyone you see, try this cake first and your life will be inextricably better. Mix both sugars, cinnamon and salt together in a bowl. Add the melted butter. Using a fork, mix all of the ingredients together. Add the flour and mix again until the mixture is clumpy but moist. Set aside. Butter a 13x9x2-inch baking pan. Sift the flour, baking soda, baking powder and salt in a bowl. In a mixing bowl, beat the butter with a paddle attachment until creamy. Add the sugar and beat until light. Add eggs one at a time, beating well between the additions. Add sour cream and vanilla and beat just until blended. Add flour mixture in 3 additions, beating well between additions. Transfer the batter to the buttered baking dish. Make sure that the batter is spread evenly. (Now for the fun part) Take a handful of the topping and crumble a thick, thick layer over the top of the batter. Make sure that none of the batter is peaking through! Bake for about an hour or until a toothpick comes out of the center clean. Now here comes the test of patience, let cool for at least 30 minutes on a cooling rack. Enjoy! My sweet dreams were dashed in the middle of the night. I woke up around 2 o’clock in the morning by a strange sound that came from the kitchen. Not knowing what it was I slowly made my way through the hall. I noticed a small light on by the pantry. Gently, quietly, using my mouse-like abilities to be as sneaky as possible, I realized I was too late. There, on the plate, pecans and caramel were strewn onto the white, innocent dish. Oh the agony! The last pecan sticky bun was stolen! I don’t blame the culprit though. 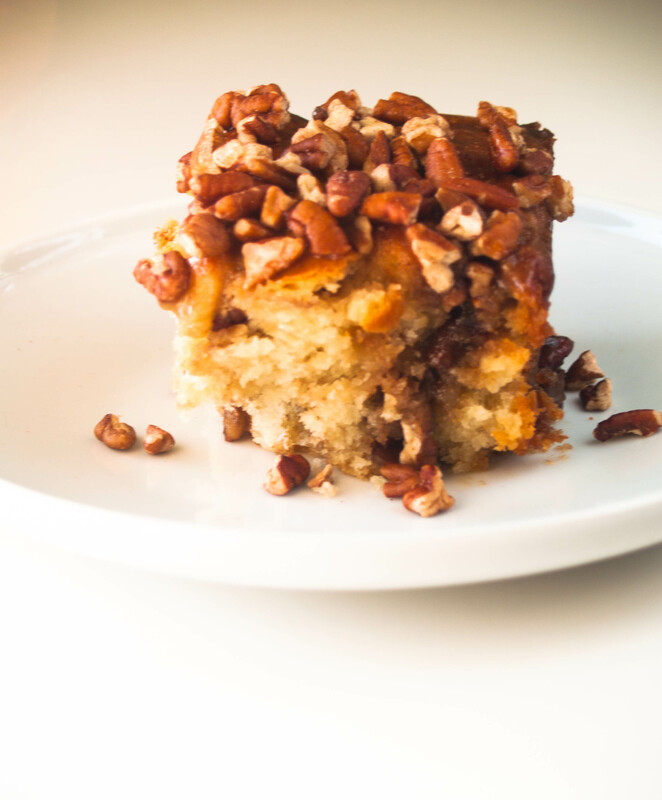 The sweet, soft dough wrapped around nutty, buttery pecans is terribly irresistible. But here I stand, staring at the empty plate with just a memory of what was missing. Then, in exaltation, I arose from my misery and ran to the cookie jar. There, lying in the tall, porcelain vessel was the truly last pecan sticky bun! Vengeance was mine! I slept like a baby for the rest of the night with an empty plate of sugarcoated pecans, a glass of milk at my bedside, and a wide smile on my face. Heat milk in a heatproof measuring cup for a few minutes until a thermometer reaches 110o. Stir in 1 tablespoon of sugar and yeast into the warm milk. Whisk to blend. Let stand for about 5 minutes until foamy. Whisk in eggs. Combine remaining sugar, flour, and salt in the bowl of a stand mixer fitted with a dough hook. Add milk mixture and butter one piece at a time until fully incorporated. Mix on medium speed for 1 minute and on medium-high for 5 minutes. Brush a medium sized bowl with melted butter and place dough into bowl. Brush the remaining butter over the top of the dough. Chill for 2 hours. Let dough rise in a warm area for 45 minutes. Spread pecans on a dry pan on low heat. Toast just until fragrant. Set aside. Melt the butter in a small saucepan over medium heat. Stir in the brown sugar, cream, honey and salt. Bring to boil, reduce to simmer for just a few minutes. Pour 1 cup of the glaze into a square 9x9x2 pan. Swirl to coat all 4 sides. Place ½ cup of pecans over the glaze in the pan. Set aside. Beat together butter, brown sugar, cinnamon and salt until creamy and blended. Set aside. Punch down the dough and transfer to a floured surface. Roll the dough until it’s about ¼ inch thick. Spread the butter mixture onto the dough, leaving an inch on all sides. Sprinkle ¾ cup of pecans over the butter mixture. Roll up the dough from the side closest to you. Pinch the ends together once rolled completely. Cut into 8 even slices. Place the dough cut side down onto the prepared dish. Whisk the egg with a little water together to create an egg wash. Brush the top of the dough with the wash. Place into a 350o oven for 20 minutes, turn the pan and bake for another 20 minutes. Spoon remaining glaze over the buns with the rest of the pecans. I am a firm believer that if a person does not love breakfast they do not love life. Maybe those people who do agree are morning people. The morning is a magical time of the day. There is stillness, a peacefulness that captivates the dwelling. As I walk across the house, room to room, hoping not to wake anyone else, I make my way directly to the kitchen. I automatically make coffee because my very happiness and sanity depends on it. And then, robe and slippers and coffee and all, I look outside and thank God for the day. 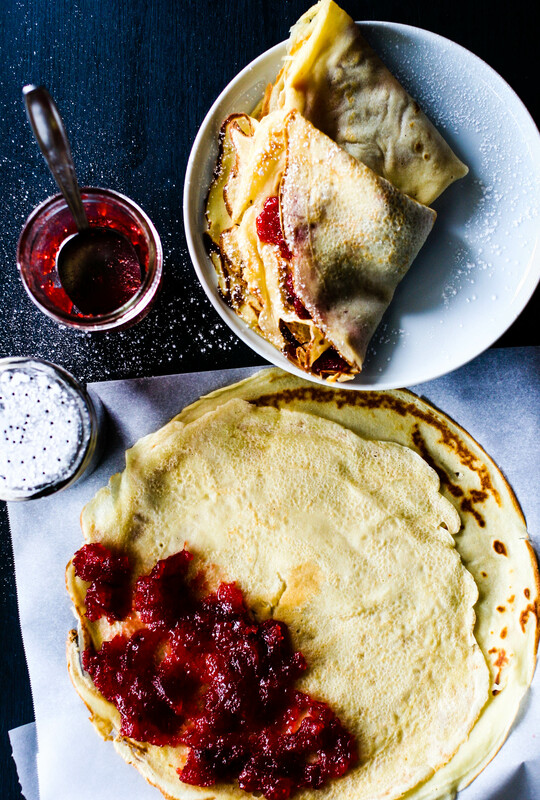 After a few moments, I slide back into the kitchen and with as little noise as possible make a beautiful breakfast. 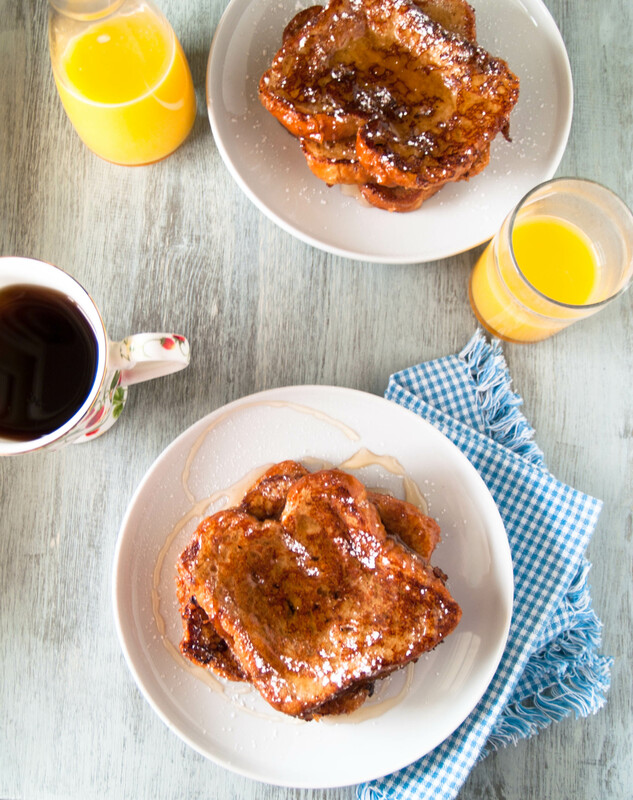 One of my favorites is French toast. I remember watching my Paw-Paw make French toast. He made his with a copious amount of sugar, which satisfies any Southerners sweet tooth. The smell of cinnamon and butter cooking together brings me back to the mornings with Grannie and Paw-Paw. They made breakfast a special time. It was in that one moment that we spent time together before the chaos of the day began. So as I stand there, spatula in one hand and coffee in the other, I am reminded of home and thankful for the privilege of passing down this tradition of family. Whisk eggs, milk, sugars, vanilla, and cinnamon together. Heat a nonstick skillet on medium heat and add just a little of the butter. Soak the pieces of bread in the egg mixture, just two at a time. Cook the bread in the skillet just until the bread is crispy on the outsides. Serve immediately. * I usually make a tester piece of bread, just in case I feel a little more sweet, vanilla-y or cinnamon-y that particular day! It has to meet my standards. If you were to walk into my grandmother’s kitchen, open the white cabinet door closest to the oven, you would find a pancake recipe scotched taped to the inside of the door. This very loved piece of paper symbolizes my Saturday mornings. My sister, Hope, and I spent every Friday night at our grandparent’s house. We would wake up bright and early on Saturday morning. There were two rules: we could never change out of our pajamas until after breakfast, there could never be too much syrup or butter applied to our pancakes. Grandma used a green bowl to mix the batter in and a ¼ measuring cup to pour the thick batter into the hot pan. Grandma was a magician with pancakes. Before I knew it, there was a stack as tall as my face waiting at the bar for us. It probably seemed like magic because my sister and me were too busy making the syrup bottle talk. It was always a hyper fellow because it had too much sugar in its belly. My grandmother is one of the happiest people that I know. She seemed especially happy at breakfast making these pancakes. I remember her waving around the spatula in the air while saying, “Praise the Lord!”. 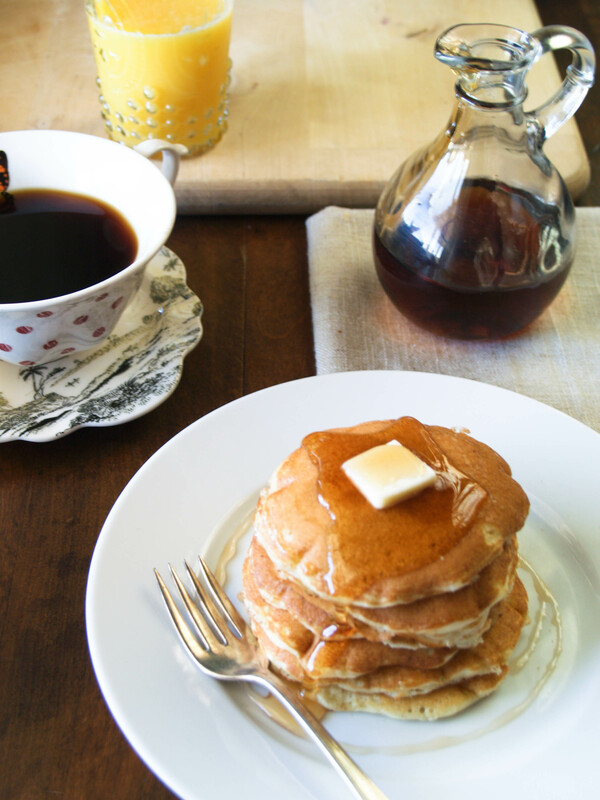 So here’s to grandma, here’s to Saturday mornings, and here’s to bisquick: just like grandma. Praise the Lord! Combine the bisquick, sugar and baking powder in a bowl. Add the eggs, milk, butter and vanilla to the mix. Put a non-stick pan over medium low heat. Use a gravy ladle to pour the batter into the hot pan. No butter needed because it is in the batter. 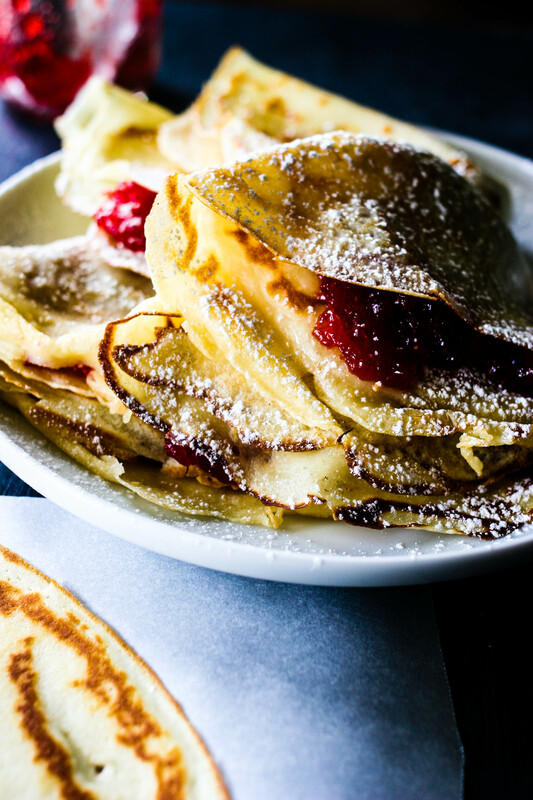 Once bubbles have formed all over the pancake, gently flip. Repeat with the rest of the batter.